This narrative takes for granted the postulates, data and myths of the Zionist entity's propaganda – which imposes permanent military censorship on the Israeli media, exposing any offender to a prison sentence; and reading the international media, one might get the idea that, like American economic sanctions, this censorship is extraterritorial – but none of them can withstand scrutiny. The aggressor is undoubtedly Israel, who carried out more than a hundred strikes against Syria since the beginning of the conflict. After Duma's chemical stage attacks, this aggresion intensified with attacks on the Syrian T-4 base on April 9, which killed 7 Iranian Revolutionary Guard. Following the US announcement of withdrawal from the Iran nuclear deal, new Israeli strikes targeted Syrian positions on Tuesday (May 8th) in the southern suburbs of Damascus, and Wednesday (May 9th) in Quneitra, in the south of the country. Undeniably, Syria has only responded to yet another aggression, with a firmness that has shaken Israel and forced it out of the muteness to which it usually confines itself. 10/ winter headquarters of a special alpine unit. And as this channel has reported, even Israeli journalists and analysts have expressed doubts about this unconvincing version according to which these massive strikes, unprecedented since 1974 and therefore unexpected, would have proved harmless, and their fears of an escalation against Iran, Syria and/or Hezbollah. Moreover, as Norman Finkelstein pointed out, nothing has changed for Israel’s wars in Gaza from 2008 to 2014 despite the deployment of the “Iron Dome”, only 5% of the – largely primitive – Hamas rockets being intercepted during “Protective Edge”; and one of the best missile defense specialists, Theodore Postol of MIT, has already revealed the chronic deficiencies of this system. It is unlikely that it was able to cope better with the much more sophisticated Russian, Chinese and Iranian rocket launchers that Syria has. The success of the Israeli strikes, which, according to Israeli War Minister Avigdor Lieberman, almost destroyed “all of Iran's infrastructure in Syria”, is largely exaggerated: Russian military officials, whose radars have followed this fight in real time, announced that more than half of the 60 missiles fired by 28 Israeli F-15s and F-16s – as well as 10 ground-to-ground missiles – were intercepted. The Syrian army records 3 dead and 2 wounded, a radar station and ammunition depot destroyed and material damage to Syrian anti-aircraft defense units. The latter have already demonstrated their effectiveness against strikes from Tel Aviv, Washington, London and Paris, unlike the mythical “Iron Dome” whose main role is to reassure the Israeli population. The “red line” that this alleged Iranian presence would pose to Israel is belied by the fact that Tel Aviv has, since the beginning of the conflict, been steadily slowing the progress of the Syrian Arab Army and, using various pretexts (delivery of arms to Hezbollah, response to actual or suspected gunfire from the Golan Heights, etc. ), assisting armed terrorist groups in any way possible: weapons, intelligence, airstrikes coordinated with ground offensives, medical care, etc. Israel, the only country in the world that officially does not fear anything (and indeed has nothing to fear) from ISIS, Al-Qaeda and the like, has seen the situation in Syria turn from a dream – see a myriad of terrorist groups tear down the only anti-Israeli Arab regime, back of the Resistance Axis, and bleed Hezbollah – into a nightmare – to face Hezbollah, Syrian and Iran forces more battle-hardened and powerful than ever, and allied with the Palestinian Resistance, Iraq and Yemen, as well as Russia –, is only continuing its destabilizing work under new pretexts, and more directly: Hassan Nasrallah, the Secretary General of Hezbollah, had announcedthat after the defeat of proxies in Syria, their sponsors could either give up or intervene more and more openly. Iran, whose opposition to the racist and colonialist project of Israel has been a principle and even a dogma since the triumph of the Islamic Revolution in 1979, is not easily provoked into an ill-thought reaction, and has always preferred to act with patience for long-term objectives – let us remember its restraint after the massacre of Iranian diplomats in Afghanistan in 1998. The goal of Iran is not to carry out a simple reprisal operation to avenge his officers and soldiers deliberately (or accidentally, as was the case in Quneitra in January 2015) killed by Israel, but to work for the complete liberation of Palestine by putting an end to the illegitimate “Zionist regime”, just like the Apartheid regime in South Africa, which, by the way, collapsed after its military defeat in Angola and Namibia against Cuban mulattoes, then viewed with as much racism as Israeli Jewish supremacism considers Arabushim. As Hassan Nasrallah pointed out, Israel's direct aggression against Iranian forces in Syria is a major turning point in the history of the Israeli-Arab – or rather, Israeli-Arab-Persian – conflict, and Israel must now get ready to confront the Iranian forces directly – whether in Syria, occupied Palestine or even elsewhere. Moreover, when the Iranian missiles enter the scene, they are launched from the territory of the Islamic Republic and with undeniable success, as shown by the strikes against ISIS at Deir-Ez-Zor on June 18, 2017, in retaliation for terrorist attacks in Tehran. As we can see, the reality cannot be more different from the fable that has been propagated by the majority of the media. “Journalists” who tamely take over Israel's talking points turn into IDF propaganda outlets and mere agents of Netanyahu's “diplomacy of lies”. Israel is indeed constantly lying to the world – and, increasingly, to its own people. And when its reckless actions have disastrous repercussions, it publishes hasty and contradictory communiqués in which it presents itself both as a victim and as a hawkish punisher, while also claiming, through Lieberman and via Russia, to have no intention of stepping into an escalation and hoping things will stop there – proclaiming the success of its retaliatory strikes is also a way to say it does not want/need to go any further. The international media contented itself with repeating these statements immediately after the first attacks, without any critical distance. Rational actors like Iran, Syria and Hezbollah – or Russia – are not in such a hurry to speak out and confirm or deny other's claims, leaving their opponents getting entangled in their lies, and trusting in the primacy of the battlefield that becomes more favorable to them day by day. Moreover, the fact that a bitter setback for Israel, which literally reverses the strategic situation, is transformed into a military success by Zionist and Atlantist propaganda, and combined with Israeli protests of non-belligerency, can only confirm the Resistance Axis in its choices. Yoav Kish, a member of the Knesset quoted by Al-Manar, stressed that regardless of the author of the strikes and their results – that censorship forbade from mentioning –, it was a major shift in the history of the wars of Israel, which is being attacked from Syria. Indeed, the Golan military installations are now directly targeted as a result of Israeli aggressions, and not just the Israeli air force, which has already seen its finest F-16 shot down on February 10, 2018. The journalists and Israeli analysts also pointed out the psychological and economic repercussions of this incident, with more than 20,000 Golan settlers having had to hastily find their way back to the shelters in the middle of the night (how much will they be at the next escalation? ), and the beginning of the summer period having been ushered in by a wave of hotel reservation cancellations due to fears of a war between Israel and Iran. The Zionist entity, which unabashedly inflicts the greatest loss and damage to the Palestinians and its neighbors, is severely shaken by the slightest losses, unbearable for Israeli society. The accusation against Iran is explained by essential factors (the inherent racism of Israeli society and its Prime Minister, who more willingly believe in a dangerousness of Persian Iran than in that of Arab Syria) and circumstantial – a refusal to assume the consequences of the suicidal policy of the Netanyahu government, which led him to a direct confrontation with the entire Resistance Axis, not to say with Russia. And most importantly, Israel wants to capitalize on Trump's withdrawal from the Iranian nuclear deal to advance its main obsession, much older than the Syrian crisis, namely Tehran's ballistic program, which it wants the West to end with, exploiting the perennial nuclear pretext. Let us remind that the manufacture, possession and use of nuclear weapons are unlawful in Islam according to Imam Khomeini and Ali Khamenei, supreme authorities in Iran. Netanyahu has made it clear that a war with Iran is inevitable, and that it would be better to happen now than later. Since 2005, he vainly strives for the United States to launch it for him, but no negotiation, sanction or aggression will ever deter Iran from its course. And just as the Israeli strikes on April 9, which were supposed to encourage Washington, London and Paris to conduct severe strikes on Syria, ended in a bitter failure, Israel only worsened its own situation yet again and finds itself alone in the face of the disastrous consequences of its actions, to the extent of the blind arrogance that triggered them. What about Russia? Netanyahu's presence in Moscow for the commemoration of the 73rd anniversary of the USSR's victory against Nazism, and reports that Russia would not deliver the S-300s to Syria, must not mislead us. Russia has invested far too much in Syria to allow anyone – be it Washington, Tel Aviv, Riyadh or Ankara – to reduce its efforts to nothing. Moscow said it would no longer tolerate Western strikes against Syria in case of a new chemical weapons masquerade, and that it is ready to provide Damascus not necessarily with the S-300 anti-aircraft system, but, according to Sergei Lavrov, with “whatever is required to help the Syrian army to deter aggression.” The current Syrian defense systems have already proven their worth – including the Pantsir, which is much more suited to the needs of the Syrian army –, and allow to envision the day when Israel loses its only advantage, namely the air supremacy that already was to no avail in 2006 against Hezbollah or 2014 against Gaza, and without which its supposedly “invincible” ragtag army would literally crumble. Israel's use of ground-to-ground missiles for the first time, and the concentration of attacks on Syrian anti-aircraft defenses – IDF released the video of the destruction of a Pantsir S-1 system, probably inactive – proves that it is well aware of its limitations. 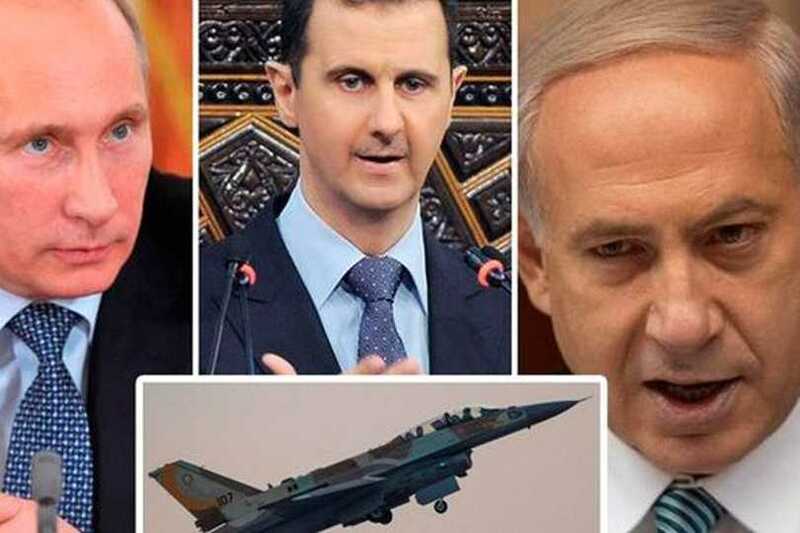 It is obvious that Israeli aggressions against Syria will be increasingly costly, both for the Israeli air force and for its internal military bases and population, because of the determination of Syria and its allies (Hezbollah and Iran) to respond to any aggression, of their experience and new capabilities, and of their successes on the ground. The Resistance Axis – of which Russia is not a part – is now able to face Israel directly on its own, with a united front and without fear of escalation. As for Israel, already overwhelmed by the peaceful demonstrations in Gaza that must culminate on May 15, it is not ready for war against a single member of the Resistance Axis, let alone against several of them simultaneously. The new equation imposed by the Syrian army on May 10 is more fearsome for Israel than the prospect of the loss of another F-16, as Damascus has shown its determination – and ability – to wage war on enemy territory, and to strike the Zionist entity in its depth, even its most strategic military bases. The Resistance Axis will soon have its eyes fixed on the occupied Golan, that Syria has never given up liberating by armed struggle – a right conferred by international law itself, this territory being recognized as Syrian by all the international community: any Syrian operation there is a legal and legitimate act of resistance against Israel’s 1967 aggression and subsequent occupation, even without further provocation. As early as May 2013, Hassan Nasrallah announced Hezbollah's participation in the opening of a new frontline in Golan. In March 2017, the Golan Liberation Brigade was formed by Iraqi Hezbollah, Harakat al-Nujaba, a movement backed by Iran and involved in the liberation of Iraq and Syria from ISIS. On the eve of the 70th birthday of the usurping entity’s foundation, Syrian strikes in the occupied Golan unquestionably open up a new chapter in the history of the Israeli-Arab wars, in which Israel will increasingly be forced into a defensive position. Are we going to see the IDF building a wall on the border of the occupied Golan to hinder any future invasion, as is already the case on the Lebanese-Israeli border to preventHezbollah's promised incursion into the Galilee? Anyway, the next war against Israel will drastically change the map of the Middle East. "Damascus has shown its determination – and ability – to wage war on enemy territory ..."
A very good article, but WHY do you present as the Sayyed? It just makes it harder to share your material.